If you’re feeling dull and weary, come and recharge your batteries by the river. Dive into this exquisite and surprising world. Despite the name, there’s no sanctuary here for the small toads and other marsh amphibians you hear croaking once night falls. On the contrary, it is the realm of the surprising and amazing. Dare to be different and spend the night in small hunting lodges. Swathed in wood and straw, they look as though they’ve just emerged from the ground. But on the inside, their decor and furnishings will delight you. You literally lift the lid and enter a different world. In the morning, breakfast is served, but it’s more like brunch. So, if life sometimes verges on the tedious and empty, there’s only one solution: leap in! 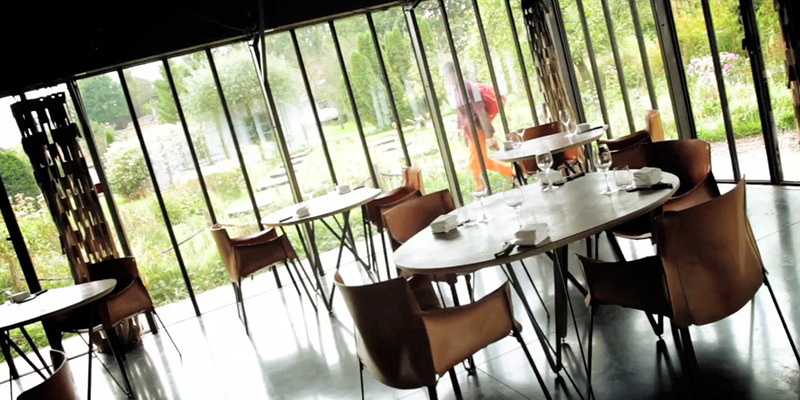 Prolong the surprise and wonder a little longer by visiting the restaurant at La Grenouillère. Get ready for the extravaganza of nature-inspired cuisine!